CH277 Comfort Economy Drafting Chairs. Features a high quality basic design at an affordable price, these chairs are ideal for home, office, study or shop. 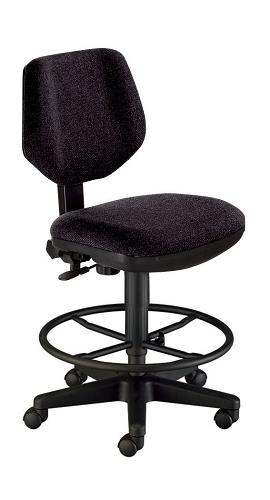 A gas lift mechanism adjusts seat height from 25" to 30" for maximum comfort. One handwheel adjusts backrest forward and backward while another handwheel adjusts backrest height to provide full lumbar support. Upholstered fabric available in gray and black. Includes 22" diameter footring that can be adjusted to the desired height and then locked into position. Strong metal frame has a black finish and is supported by a 24" 5-star metal base with double wheel hooded casters. Full 2-year warranty on all metal parts. Optional armrests available.